Why is Building Off-Grid More Expensive? Lately I have noticed that we’re receiving an increasing number of emails inquiring about living off grid. How exciting! One of our goals at Rewild is to inspire people to embrace self-sufficiency and to live more sustainable lifestyles. The fact that our clients are routinely asking for solar panels, compostable toilets and rainwater collection systems is a sign that we’re doing something right. Or, rather, that you’re doing something right! Unfortunately, there is an abundance of inaccurate information about off grid living floating around the internet—particularly regarding how much it costs to build and run an off grid home. So, I took it upon myself to write this blog post in hopes of shedding some light on the true cost of off grid living. First, it is important to consider your definition of ‘off grid’. The term generally refers to living without access to public utilities such as power, water and sewer connections. Living without these amenities is absolutely possible. (Lest we forget, human civilization was surviving just fine before the invention of the light bulb). However, when most people talk about living off grid today, what they mean is living off grid with the same comforts as living on grid. What they’re talking about is not just living remotely, but living remotely with working electricity, running and potable water, adequate bathroom and shower facilities, and the ability to cook and refrigerate food. So, if by ‘off grid’ you mean reading by candle light and peeing in a chamberpot, then yes, building an off grid home is less expensive than building an on grid one. But if you’re looking to live off grid with all the creature comforts, it’s going to cost you more than a couple of candles and an old bucket. At Rewild, we design homes that function at varying levels of autonomy, or, for lack of a better term, ‘off-gridness’ depending on your budget and needs. Off grid additions can range from a supplementary solar system that powers your kitchen lighting and a small potable water tank, to a house powered fully by solar accompanied by a rainwater collection system with storage cisterns, filtration systems, and pumps that pressurize your water. Over time, (re)using these systems will save you money, as they are a renewable resource. However, the initial investment in off grid systems in unavoidably expensive. Think about it. It takes a lot of highly specialized technology to harness energy from a sphere of flaming plasma 150,000,000 kms away from us, store it, and then convert it to something that can power your Netflix account. To give you an idea of the price of these systems, check out the ‘Off Grid Gear’ page on Tiny Life Supply’s webpage. We source a lot of our off grid equipment and logic directly from them, and they are an excellent resource when it comes to researching the cost of living comfortably off grid. Off grid systems also take up a significant amount of space and add a lot weight to your home. Because of this, off-grid homes are usually better suited for either permanent homes that can house some of their systems externally or bigger homes on larger trailers with a greater number of axles that can bear the additional weight—all of which add cost in materials and labour. Off-grid homes also require a lot more planning—both from a lifestyle and a design standpoint. If you’re serious about living off grid, we take special care to customize a system that suits your individual needs, based on your usage habits, appliances/electronics, and your intended parking location (i.e. how much sun and rain you can capture). Even relatively simple off grid additions can drive up the cost of your home. For example, the difference in price between a standard flush toilet and a Separett compostable toilet can be well over $1000CAD. Another good example to consider is your heat source. An average electric heater will cost anywhere between $50-100CAD, whereas a good quality propane heater or pellet stove can cost upwards of $1500CAD, with some of the industry's leading wood stoves costing up to $5000CAD, such as the Kimberly & Katydid stoves from Unforgettable Fire LLC which are frequently featured in tiny homes for their sleek design, super minimal clearances, and unparalleled efficiency (also available through Tiny Life Supply). In the long run, being off grid has a lot of benefits, both for the environment and for your personal sense of independence and self-sufficiency. The initial investment to build an off grid home is high, but it has the potential to pay for itself over time. Ultimately, building an off grid home ain’t cheap—but in our opinion, the ability to live wherever you want, without reliance on anyone else, is priceless. Thinking about downsizing? Want to know what living in a tiny house is actually like? Looking for an inspiring, hilarious, and sometimes heartbreaking book to read? The Big Tiny is a “Built-It-Myself Memoir” by Dee Williams, one of the premier educators about living tiny. From living in a big house with a big mortgage to taking the leap and building her own tiny house, Dee’s book will make you laugh out loud and reconsider life. It was refreshing to read something so honest and relatable – I could definitely see myself accidentally screwing my hair to the side of a house if I tried to build one myself. “The Big Tiny is the story of how one woman built her own house with her own two hands – all 84 square feet of it – and discovered that the important stuff in life isn’t stuff. Dee’s site is padtinyhouses.com (Portland Alternative Dwellings) and you can buy her book on Amazon here or order it from your local library. But What About the Toilet? Wheatgrass Tiny Home Community is Hosting a Tiny Home Festival! Video tour - take a walk through our off-grid Blue Heron home! We had a blast with Danielle and Mat from the Exploring Alternatives YouTube channel. Check out the video and give them a follow because there are two more Rewild tiny home walkthroughs on the way! The Ptarmigan, a single level, overwidth tiny home...and maybe our favourite yet?! 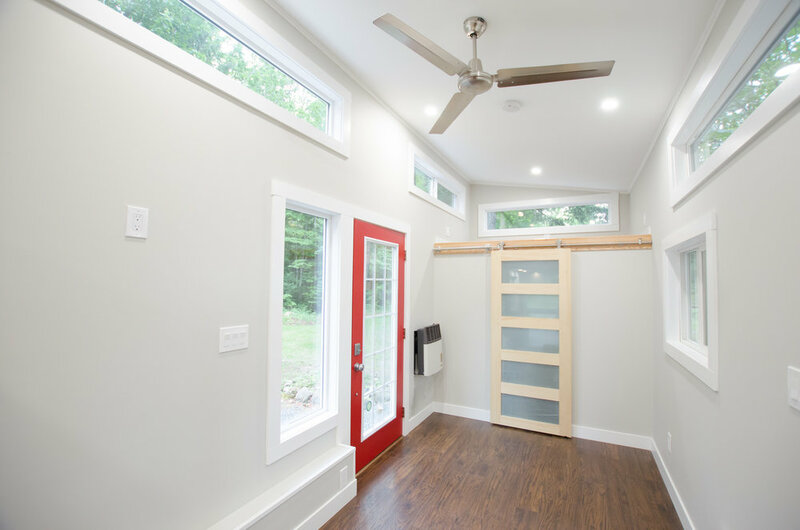 Rewild Homes Open House - Two Tiny Homes on Display! ProjectWonderland! Making the move to a tiny home with Nico + Kate. The Capilano Courier did a feature on one of our upcoming builds! Our Kingfisher home has SOLD! Fall building begins: getting the trailer & starting the floor package. Rewild Homes is starting a new (and totally kickass) build! Types of toilets for tiny homes. There are four main options for the toilet in a tiny home: composting, RV style, house style, or sawdust bucket. We are going to be featured in Journey Magazine's fall issue. Recent build is FINISHED and delivered to Saltspring! We are Vancouver Island's premier tiny home builder. Our focus on using high-quality materials and fixtures ensures that every one of our homes meets the highest standards of luxury, longevity, and sustainability. Looking for somewhere to park your home? Check out our listings page! Fill out our questionnaire here to start the process. Sign up with your email address to receive news and updates on builds, openings, and events. We respect your privacy. Your email will be kept private and we promise not to spam you.